On Tuesday, January 15th, William Barr started his two-day confirmation hearing for the position of Attorney General with the Senate Judiciary Committee. Barr fielded hours of questioning on his thoughts on Special Counsel Mueller’s investigation into Russia’s interference in the 2016 election. A more poignant remark couldn’t have been made, when most are worried about Trump’s nominees being placed in positions to push forward his plans, in the face of push back from Congress and Senate. What makes Barr’s answers questionable, is a 19-page memo written in June of 2018 that contradicts the opinions he stated in front of the Senate on Tuesday and Wednesday. In his memo, Barr states that “Mueller’s obstruction theory is fatally misconceived” and is “legally insupportable.” The memo goes on to talk about how “this theory would have potentially disastrous implications” if the department embraces Mueller’s theory. Throughout the hours of questioning, Barr provided affirmation that he would allow Special Counsel to continue and complete his investigation into Russia’s interference in the 2016 election. Repeatedly, Trump has called Mueller’s investigation a “witch hunt” and accused special counsel of pursuing a politically charged campaign against him. When asked, Barr said, “I don’t believe Mr. Mueller would be involved in a witch hunt.” He even continued to say that it would be “unimaginable” that Mueller would participate in actions that would warrant his removal. When Senator Feinstein asked for Barr to pledge to keep Mueller on the job, he responded confidently saying “absolutely” and committed to providing the necessary resources to the special counsel’s investigation. In 2017 when Jeff Sessions, Trump’s last Attorney General, recused himself from overseeing Mueller’s investigation it caused a major point of disagreement between him and the President. Trump then repeatedly voiced his frustrations with Sessions’ choice and his criticism over how the investigation was being handled. Another concern is Barr’s lack of commitment on recusal. When asked if on the advisement of the ethics committee if Barr would recuse himself, he said “I make the decision,” also stating he would take action “in good faith based on law and the facts.” Ultimately, he said he would listen to their recommendation, but in the end, it would be his decision to make and wouldn’t commit as to whether he would listen to the ethics officials or not. His recusal has been questioned since his 19-page memo was disclosed last month, where his views strongly opposed Mueller’s investigation into obstruction of justice. Through all the questioning, Barr presented himself as someone who is able to act freely and as someone who is not worried about any potential pressure he might face from the President should they express differences of opinions. “I’m in a position in life to provide the leadership necessary to protect the independence of this department. 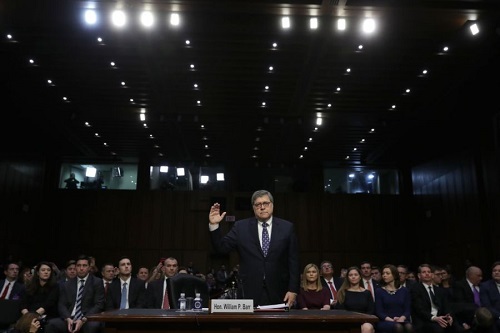 I won’t do anything that I think is wrong; I won’t be bullied into doing anything I think is wrong”, Barr said to the Senate Judiciary Committee. It’s safe to say William Barr will be confirmed as Attorney General, considering the Senate is currently controlled by Republicans. It also helps that he is a safe nominee for Trump to pick since he worked as Attorney General for the George H.W Bush administration. Cenk Uygur and Ana Kasparian make a fair point when asking the questions: Why is a random lawyer writing a memo when he’s not working on any political cases unless he was planning on being considered for Attorney General? Was that Barr raising his hand and telling Trump that he would defend him? And lastly, is that the real Barr or was the Barr in front of the committee the real Barr? Uygur goes on to say that he believes Barr won’t necessarily protect Trump unless it’s good for himself and he ultimately believes that is how Barr will make his decisions. At face value, Barr’s responses seem to be exactly what the committee would want to hear. However, which do we believe? His memo saying the investigation isn’t right and he supports Trump or the answers he gave the Judiciary Committee on Tuesday and Wednesday? Unfortunately, if the Senate confirms him as Attorney General, only time will give us the answers to what appears to be a convoluted and contradictory mess.